All transactions are safe and secure with a reliable history in online purchasing behind each of our associates. 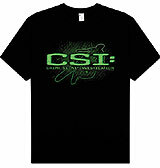 Buy CSI t-shirts including the CSI Miami t-shirt. 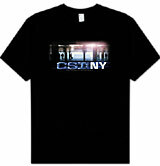 See the CSI hats & clothing for Las Vegas & NY TV shows. CSI: Crime Scene Investigation (a.k.a. 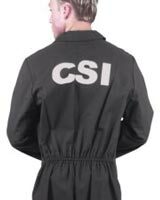 CSI or CSI Las Vegas) is a CBS TV show that centers its storylines around a fictional Las Vegas crime lab, headed by lab supervisor Gil Grissom (William Petersen). 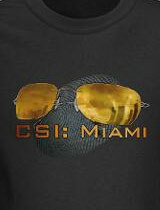 The CSI TV show spawned two successful spin-offs, CSI Miami and CSI New York. 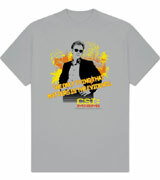 Here, you can pretend you are part of Gil Grissom's team with our selection of CSI t-shirts. 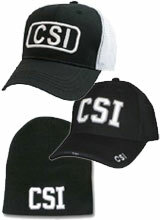 The clothing below includes the basic CSI Las Vegas t-shirt and hats, in addition to an official looking CSI Miami t-shirt. 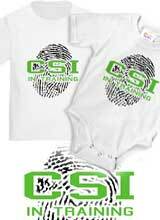 Process your next crime scene in a CSI costume, which is perfect for Halloween parties. Comfortable CSI sweatshirts are also available featuring many of the designs from the CSI apparel and merchandise shown below. Browse through each item to see all available clothing styles. 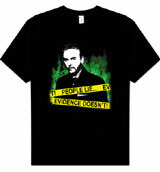 In the CSI Las Vegas episode "Crate n' Burial" from season one, supervisor Gil Grissom (William Petersen) offered a memorable quote, "I tend not to believe people. People lie. The evidence doesn't lie." This Gil Grissom quote went on to become one of the main themes of the TV show; always trust the evidence. 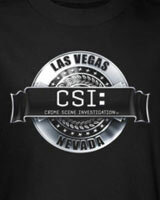 This CSI Las Vegas t-shirt is available in a variety of colors and styles. 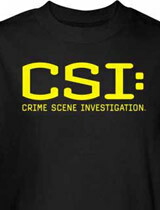 Wear it with a CSI hat. 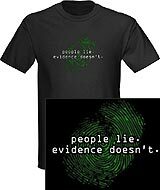 Link to: People Lie. Evidence Doesn't.